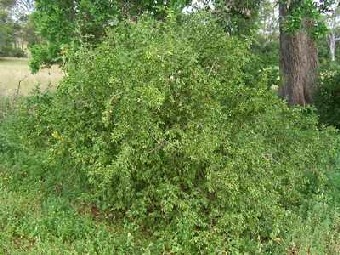 An erect shrub with many rigid branches growing up to 4m high and about 3m across. The branches are leafy and often end in a spine. It grows on neglected land in arid sub-humid and semi-arid subtropical regions. It has been used for hedges in Australia on properties and this has allowed it to grow into pastures. It is also found on drier soils, along roadsides, railway reserves and in waterways, particularly on the lighter soils along dry creek beds. The stems are light brown when immature and brown or grey when mature. The stems branch vigorously. There are spines up to 15cm in length which shoot from the main stems with smaller spines on the numerous small branches. Each of these smaller branches ends with a spine. 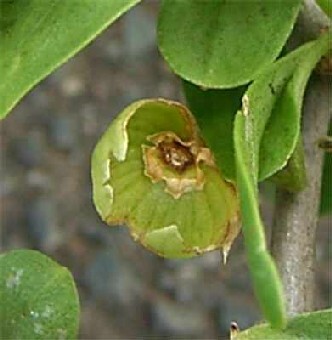 The leaves are glabrous (without hairs or scales), green, fleshy, elliptic to obovate, and up to 40mm long and 4-10mm wide. They are clustered in groups of 5-12 but on young shoots, single, alternate leaves may appear for a brief time at the many nodes. The leaves are larger and more succulent on regrowth from damaged plants. The flowers appear either singly or in pairs at the leaf-stem junction. They are white or pale lilac with a lilac-purplish throat and are about 1cm in diameter, 5 petalled and fragrant. The calyx (the sepals of one flower collectively) is 4-7mm long and has 5 unequal teeth. The flowers are 10-12mm long with the 5 stamen projecting to 2- 4mm past the petals. The flowers appear mostly in summer but there is also some flowering throughout the year. 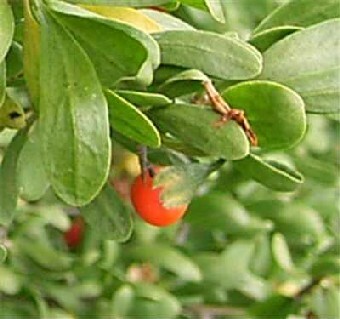 The fruit is a berry that is smooth and shiny with a short drooping stalk. It is globose (ball-shaped) to broad-ovoid shaped and is 5-10mm in diameter with a prominent calyx. The berry ripens to a dull orange-red colour with up to 35-70 seeds. The seeds are 2.5mm long by 1.5mm wide ovoid or irregular in shape and flattened. They are light brown to yellow and dull with small raised dots on the surface. 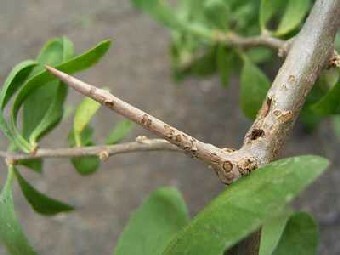 It can be distinguished from Chinese Boxthorn Lycium barbarum in that L. barbarum has lateral branches that are mostly <10mm long and leafless and do not end with spine. 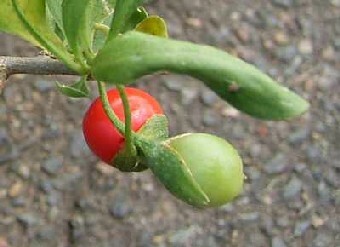 The leaves are mostly ovate and the berry is ellipsoid. Whereas in Lycium ferocissimum the lateral branches are mostly >10mm long. The branches are leafy and end in a spine. 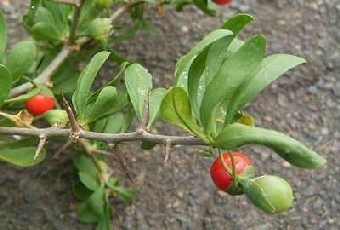 The leaves are mostly obovate and the berry is globose.